There are things that must be done to ensure that pipes do not freeze. Heater tapes wrapped around the pipes or a heated reflector lamp in dry enclosed space works great. 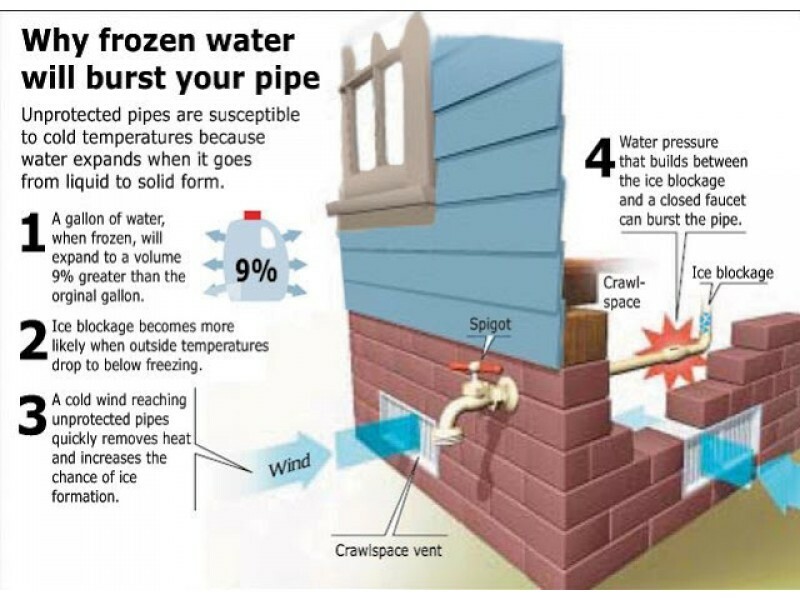 Thaw out a frozen pipe by checking to see where the pipe is frozen at. Some plastic and copper pipes will split and flood and area when thawed out. In this case it is better to call a plumber. an electric space heater placed around the frozen part or a hand held hair dryer can help to unthaw local frozen pipes. 2. wear short or tight fitting sleeves. Long loose sleeves are more likely to catch on fire or get caught on pot handles. 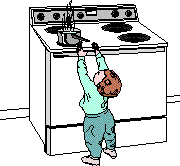 4. enforce a “kid-free zone” of 3 feet around your stove. Turn pot handles inward facing the wall to prevent burns caused by overturning or spills. 5. keep the area around the stove clear of towels, papers, pot holders or anything that could burn. 6. cook at indicated temperatures settings rather than higher settings. 7. regularly clean your cooking equipment so that there are no cooking materials, food items or grease accumulation. 8. have a pot lid handy to smother a pan fire. Do not attempt to pick up the pot or pan. Shut off the heat and cover the fire with a lid. Do not use water. It will cause splashing and spread the fire. The temps are really cold not reaching above the mid teens here today. If this is the way your area is then you need to take care of yourself and that means protecting yourself against the cold air. Have you been following a recipe and realize you don't have all the ingredients? Well I know that this has happened to myself and many others as well. The blog Simply Stacie has created a great post sharing all about what to use when you dont have what you need. 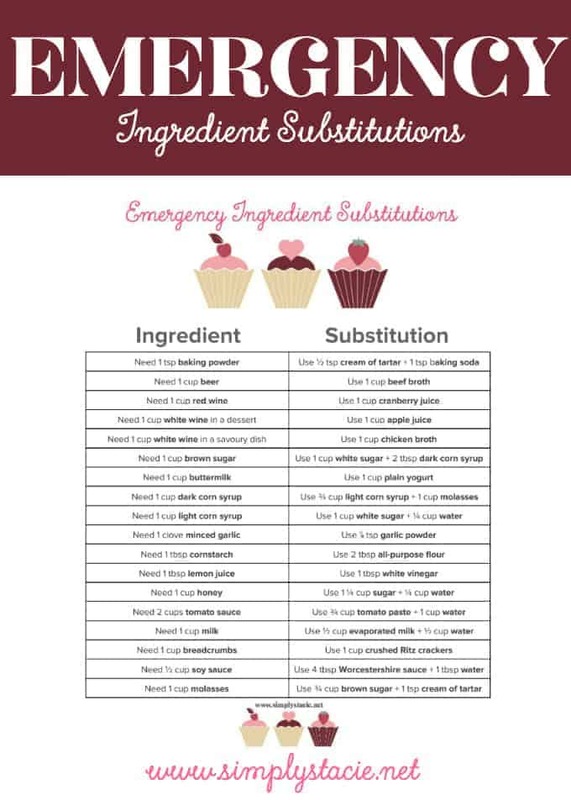 Check out the Emergency List, it may even be a great idea to copy or print it out. The world has certainly changed with women being welcomed into jobs and hobbies where they never would have had a fair chance before. Construction, reconstruction always seemed to be a mans world of the past. Now I have many friends who are women like me are destroying, creating and recreating beautiful homes. 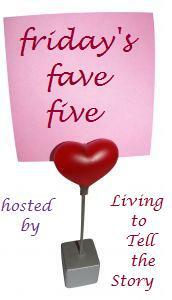 Whether you decorate, build or are a weekend warrior I am sure of your work and what you do. Let me introduce you to The Little Pink Tools a division of K J Tool Kits Inc. A woman owned family run company with over 30 years experience in the tool and custom assembly business. They do all their own work from answering phones, processing customer orders and assembling and shipping each order to ensure customers get what they ordered on time and the way they ordered it. They offer an awesome guarantee on their tools as well. Hand Tools are "lifetime guaranteed". If a tool should break call us for a free "no-charge" replacement. Zipper Tool Cases are covered for 1 year against defects in materials and workmanship. This guarantee includes free replacement if a zipper fails within the first year. 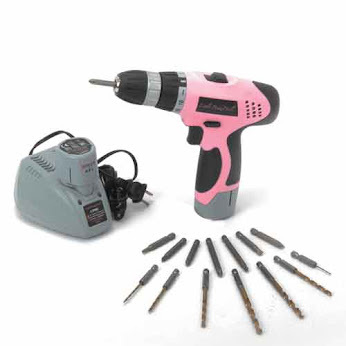 The Little Pink Drill is guaranteed for 1 year. This guarantee includes the drill, batteries, and charger. As you read in the previous post it is National Cancer Prevention Month. Little Pink Tools does their part to give back by giving 10% of all sales to Stefanie Spielman Breast Cancer Foundation at the James Cancer Research Center of Ohio State University. The Stefanie Spielman Comprehensive Breast Center is the first of its kind in the Midwest to offer the full continuum of breast cancer care. The full circuit from prevention and screening through detection, diagnosis, treatment and survivorship is dealt with in one world class facility. We found ourselves lucky enough to be sent the Little Pink Tools 12 v Li-on cordless drill from little pink tools. The ease of the drill is something that has no measure, the freedom of moving about, the feel of the drill all makes this drill untouchable. The best part to me is the color of the drill. While one of my favorite colors it is also one that will not be found in my husbands toolbox and all will know that it is mine and mine alone. I am not into construction work but I do love to decorate and re-do vintage items. The drill will come in handy with any of my projects. What is it you like to do?? Take a look at Little Pink Tools website and see all they have to offer. 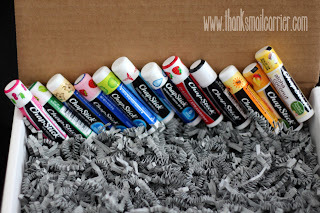 Enter to win a chap stick prize pack on the blog Thanks mail carrier. 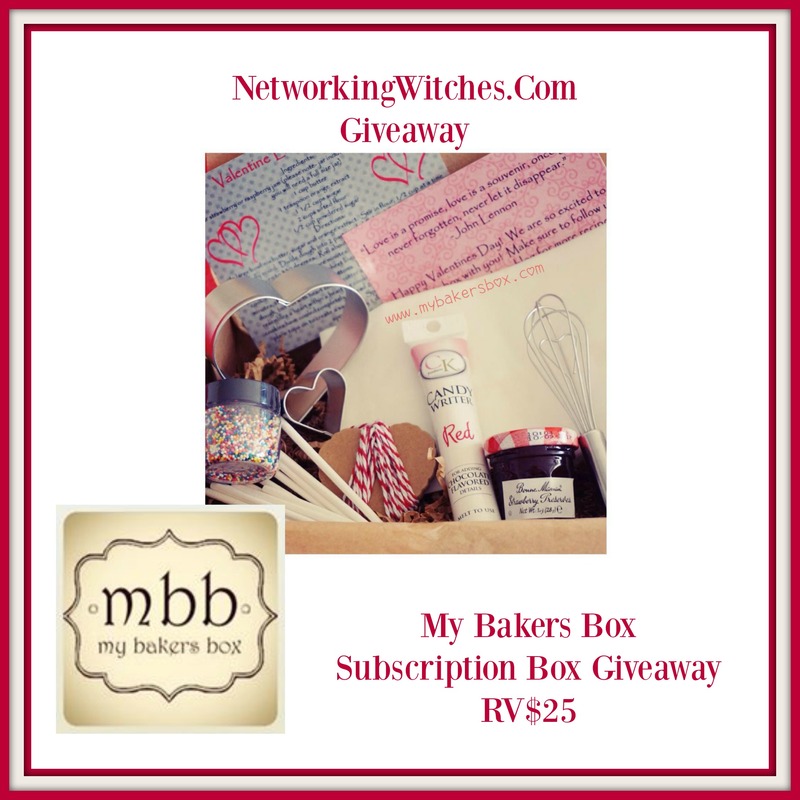 Giveaway ends February 24th. Happy Birthday Abraham Lincoln. Get the entire family in on the celebration with a bit of fun. Try one of the pretzel stick cabin crafts. Mr. Lincoln grew up in a cabin and was famous for wearing a top hat. The cookie and candy top hat snack recipe is fun to make and share as well. These log cabins are fun to make, helps tell the story of Honest Abe and are edible as well. 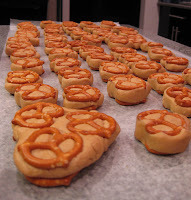 The pretzels are glued on via vanilla icing. Let your child decorate the cabins using their imagination with grass, trees, or however they wish. For older kids or even a challenge for your self try to remake the log cabin 3D figure using pretzel sticks. 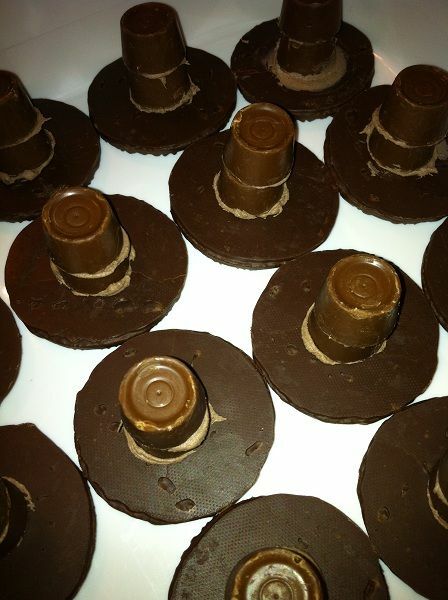 Fix a snack that resembles old Abraham Lincolns top hat. Make this yummy dessert for your sweetheart. Cream cheese, sugar, and cookie dough. Make the cookie dough according the directions in Cream Cheese Sugar Cookies Bake in 375 oven for about 12 minutes or until edges barely get browned. Cool on wire racks. Invert out of the tart pans when cooled off. Mix the sliced peaches with the sugar; set aside. With an empty shell, fill 1/2 way with pudding. Put in refrigerator to set. About an hour. Top with peaches, garnish with whipped cream and sprinkle cinnamon on top if desired. What’s the rudest comment from a stranger you have ever gotten about your parenting style? I simply hate how rude parents can be to other parents. When one parent judges another and expresses their opinion it can often be rude or seem rude. Without being in the shoes of that parent dealing with the child and decisions that must be made the parent looking in should not criticize. (The only exception to me is in cases of abuse. If you see or know of a child being abused this should be dealth with) Family, friends and even total strangers all feel that they can and should express their opinions and sometimes it is not done in the nicest terms. There are things that we should be allowed to do and it be our choice as the parent to decide. The way we dress our children is one of the first things that will be picked on by others. I was blessed when expecting my first child to be blessed with a wardrobe of clothes that a friends son had out grown. With not a lot of money as a young parent I decided that I would use the boys clothes with my daughter and make them look as cute as I could. Of course this did not set well with many but at least she was dressed and looked cute as ever. I would love to tell you that little baby girl is now 29 years old and the boy clothes did not diversely hurt or change her in any manner. Some of the things said I do still remember and they did hurt. Another area that I have had many disagreements along the journey of parenting is the diet I let my children have. Yes I do love my children and I do want them to have good health but I do let them have treats along the way as well. My Sister had a totally different version of what type of diet kids should be on. She thought she was right and there was no discussion about it of course though she shared with me all the things she thought I did wrong. I should share with you that my children are all healthy, have good eating habits and are sharing that with their own children. Perhaps, no I know that there are different ways of raising children and while we may think that we are right we must also allow other parents to have their way of doing things. Discipline is another big area where parents have discussions and strong opinions. There are several parenting styles and I have often been criticized in mine. I do not believe in taking a hand to a child in any manner. That is my style I use time out, privalage lost and point system to decide rewards. I know that there are parents with other standards but for one reason or another it is my standard that gets the criticism. Our job as parents is not to do what is the easiest but what is in the children's best interests. How about you? If you've ever faced something like this, do share! Mix the peanut butter, butter and vanilla. Then add in the salt and slowly mix in the powdered sugar, until incorporated. If the dough is getting too stiff, add in a tablespoon of milk to help move it around a bit. You'll want it to be a doughy consistency, so it's easy to work with it. Melt the chocolate over a double boiler and coat the little hearts on both sides. Lift out with a fork, tapping it on the edge of the bowl to let the excess chocolate drip off. Place on a piece of wax paper, and into the fridge to cool. I doubled the above recipe, because I wanted to make tons to share with co-workers and J's family this Sunday. Instead of 4 cups of powdered sugar, I stopped at around 3 1/2 cups and it was a nice, doughy consistency that tasted peanut buttery and n ot too sweet. I think the full 4 cups would have been too sweet in this case. We got to work shaping the little hearts, which was fun to "play with your food." Our double batch yielded about 61 or 62 little hearts, and then J made a big one which equalled about 3 - for a grand total of about 65 for a double batch, so I'd say low - 30s for a normal batch. Surprise all your friends with this dessert they will never believe that it started with a mix. Its the perfect cake to make for the group when time is short. . Prepare cakes according to box directions. Let cool, frost bottom layer with peanut butter frosting, then a layer of chopped up peanut butter cups. Place top layer onto bottom layer and frost tops and sides of cake. Put the rest of the chopped peanut butter cups around the sides of cake to give a more decadent look. Refrigerate cake. - To make a round layer cake for less people, use one box of cake mix prepared for a double layer cake, cut the frosting recipe in half. Beat the peanut butter until very smooth, gradually beat in powdered sugar, add vanilla. Then add milk 1 Tbsp at a time until desired consistency is reached. Frost cake. In honor of him and his magical powers I decided to make up some magic bars. These I have enjoyed most of my life and yes they do taste very magical. That is my opinion and yours may be a bit different. But if you like nuts, chocolate, coconut treats then you have to try this. You start out with a graham cracker base, pour sweetened condensed milk on top of the crust, then layer the coconut, chocolate chips and nuts on top. Bake and you're done. They're a little sticky and gooey in spots. They're sweet but not too sweet and they have great texture. The nuts are crunchy, the crust is buttery, it's just good. You could always add dried fruit or omit the nuts and switch out the chocolate of your choice. Heat oven to 350°F. Spray 13 x 9-inch baking pan with non-stick cooking spray. Combine graham cracker crumbs and butter in small bowl. Press into bottom of prepared pan. Pour sweetened condensed milk evenly over crumb mixture. Layer evenly with chocolate chips, coconut and nuts. Press down firmly with fork. Bake 25 to 30 minutes or until lightly browned. Loosen from sides of pan while still warm; cool on wire rack. Cut into bars or diamonds. In a bowl, sprinkle gelatine over cold juice; let stand 1 minute. Add hot juice and stir until gelatine is completely dissolved. Pour into a 13x9-inch pan, chill until firm. Cut into 1-inch squares or cut into shapes using cookie cutters. NOTE: Make sure you use clear juice. You can use orange juice or other nectars, but you won't get that shiny translucent effect that the clear juice gives. Also, make sure the juice is the color you want. Hold the jug up to the light in the supermarket to see the true color of the juice. I used cherry juice and it was a little pink so I added a few drops of red food coloring to make them more vibrant. Boil the chicken pieces for about 20 minutes. Mix together flour, corn meal, garlic, paprika, pepper, salt, cinnamon, and baking powder. In a separate bowl, beat the egg; add milk and cooking oil. Add wet ingredients to dry ingredients and mix well with wire whisk. Pat the chicken dry with paper towels. Heat oil to 360 degrees. Dip chicken pieces in batter and fry about 3-4 minutes or until golden brown. Fry a 3-4 pieces at a time. Let drain on paper towels, serve hot. - For a little extra kick, add some dried or prepared mustard to batter. Pre-heat a square frying pan over medium-low heat. The key to any good french toast or pancakes is getting the pan's temperature just right with pre-heating! In a shallow bowl or pie plate beat 2 eggs with a few tablespoons of water (or milk) to thin out. Soak each slice of bread for a few seconds each side to absorb the egg mixture. Spray the pre-heated pan with non-stick spray and lay the four slices on, evenly spaced. Cook on medium heat for a minute or two each side until lightly browned and no longer soggy from the egg. Remove from the pan and place on a plate. Tip: If cooking more than one batch, the perfect place to store the plate is in the microwave! It is an insulated little box that will keep the heat in while you continue with the next batches. Just add each batch to the plate and place in the microwave and close the door until ready to eat! This also works for dinnertime if you are on slightly different schedules and expect to eat a little later. My tip for fresh fruits and vegetables is to "process" them as soon as you get home from the grocery store, after you've put away the other items. Wash them, and if necessary, cut and peel them. This makes you more likely to grab and eat fruits and veggies because it's convenient and quick! Plus you get it all out of the way once and only one cutting board and knife wash! Next I slice the pineapple into quarters for easier handling. Lob off the leafy ends of each quarter. This is important because you are creating a flat surface to cut on. Stand each quarter up on it's now flat base and cut the point off where the tough core is. Now turn the quarter and slice off the exterior skin of the pineapple. I can usually do this in two knife movements, but sometimes go back to clean up areas that were missed. As you're done cutting each quarter deposit these slices into an airtight container for easy storage. Voila! You've cut a fresh pineapple in just a few minutes. Depending on size, I'm usually awarded with about 4 cups of fruit. While looking for a red velvet cupcake recipe I found this super cool cupcake that offers the red velvet cake with cream cheese on the inside so there is no need for icing The red tender cake with a cream cheese center sounds like a yummy treat for your valentine. They are not as sweet as one would suspect so they may be considered muffins but to me muffins are a bit boring and these are very exciting to me. Preheat oven to 350 degrees F. Line 8 (I needed 9) muffin cups with paper liners. Prepare filling first. With a mixing spoon, beat together softened cream cheese and sugar. Add egg and vanilla and stir until smooth. Set aside. In a mixing bowl, thoroughly stir together flour, cocoa powder, baking soda and salt. In a second mixing bowl, stir together oil, sugar, vinegar, egg, red food coloring, vanilla and sour cream. Mix very well, then add the flour mixture and stir just until blended. Measure out approximately 1/3 cup red mixture and set aside. Divide remaining red mixture among the 8 muffin cups – each cup should be a little over 1/3 of the way full. Spoon cream cheese mixture over red mixture, dividing evenly between all cups. Drop small spoonfuls of reserved red batter on top of cream cheese mixture, making a bulls-eye pattern. Bake for 20-23 minutes. Let cool on a wire rack. Carefully remove lift muffins from cups. It was just February the 2nd when old Phil did not see his shadow. This gave us all hope that spring was on its way. The warmer than normal days also helped this out. But could it be that Phil was wrong?? I hope not but in the meantime here is a list of ideas to do inside with the family when it is too cold and snowy to head out there. 3. Fold that basket of socks. Throw away all the mismatched ones. 5. Bake muffins. Or cupcakes. Or both. 14. Create lists. Like this one. 17. Photograph "A Day In The Life"
21. Go sledding. You are never too old, I promise you. 24. Hold a Psych marathon complete with pineapple-themed desserts, snacks, and delicious puddings. 26. Have a picnic, inside. Complete with basket & plaid blanket. 27. Assemble a time capsule. Fill a plastic container or coffee can with photos, mementos, & present day items. Hide in a closet & wait until Spring - then bury it! 35. Go to a roller rink & skate till you drop. 38. Make or give something...a pie, a pack of stationary, etc...to someone, maybe a neighbor, leave it on their doorstep, ring the doorbell, and run away. 41. Create a binder full of projects you want to accomplish and use photos from the internet or magazines. Yeah, I know this is what Pinterest is for, but sometimes it's helpful to have something at your fingertips. 42. Build a fort out of blankets. Again, you're never too old for this. 44. Begin a stockpile of gifts for future use - baby shower, wedding gifts, hostess gifts, etc. 45....what's else can YOU think of?